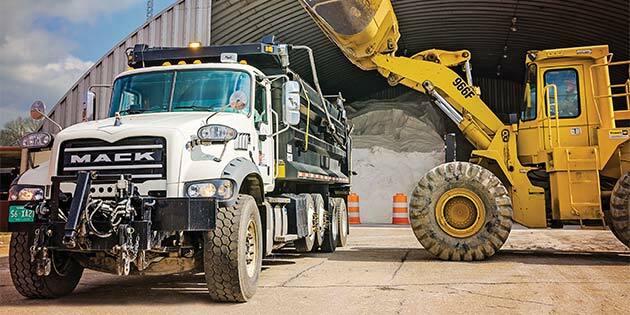 When the Tennessee Department of Transportation’s eastern region faces big problems, they turn to the heavyweights of their fleet — Mack® trucks. From snow and ice to tornadoes, washouts and rock slides, their Mack Granite® and Pinnacle™ models can handle it. And when there isn’t a big problem, their Macks keep the highways open by getting pavement patched before a small problem gets out of hand. TDOT regional operations engineer Benjamin Price keeps a sharp eye on everything from his Knoxville, Tennessee, office, which overlooks Interstate 40. He manages nine construction offices, six district maintenance offices and more than $500 million per year in roadway ­contracts. On his computer, hundreds of photographs document his trucks in action. With 17 years in the industry, he has seen more than his share of highway projects and roadway hazards. The department’s day-to-day operations include keeping the interstates, principal arterials and designated state routes mowed and free of potholes and debris. The Macks are used for more demanding projects, such as paving and repairing the roads following rock slides. Price keeps two Pinnacle axle forward models are on standby, each with a flatbed loaded with paving and repair equipment ready to spring into action at a moment’s notice. During wintry or severe weather, the fleet operates at full utilization. As soon as snow or ice is predicted, the crews begin preparations to deploy. The Knoxville area typically has three to four plowable events each winter, whereas counties in the mountainous northeast quadrant of Tennessee may plow dozens of times a year. Though Price runs an older, mixed model Mack fleet, they continue to perform well, even under the harshest conditions, he says. He attributes the fleet’s health to a robust preventive maintenance program and great service and support from his local dealer, Worldwide Equipment. Customer service after the sale is critical, says Scott Pekar, TDOT’s salesman at Worldwide Equipment in Lexington, Ky. Together, he and TDOT have worked to create the durability and performance specs they need, along with focusing on safety through improved visibility and braking systems. Benjamin Price, regional operations engineer at the Tennessee Department of Transportation talks with Chris Branham, TDOT Operations Technician. The road crews depend on their Mack fleet for heavy-duty work, especially during the winter, when roads must constantly be kept clear of snow and ice. TDOT is working with Pekar to update to a more uniform fleet, reaping the benefits of improved technology and simpler ­maintenance. Their newest Granite models are equipped with 13-liter Mack MP® engines with 425 hp and 1,850 lb.-ft. of torque. They also have two lift axles for added payload capacity. The new trucks are not only more effective, but they bring unexpected benefits as well. When it comes to plowing, the trucks are equipped with underbody scrapers and spreaders, as well as plows. Price considers his Macks to be a worthy premium product compared to other ­manufacturers. Drivers of the newer trucks also enjoy the benefits of better ergonomics and comfort, from power windows and doors to air conditioning. Price says he plans to stay with the Mack brand, because it has been a faithful performer for so many years. Though he is not currently using the mDRIVE™ automated transmission, he was impressed with a recent demonstration, which involved stopping an unloaded truck on a steeply graded gravel incline at the Mack Customer Center.